Telomeres are essential for chromosome stability and the telomere G-overhang structure is essential for telomerase-mediated telomere maintenance. We have recently adopted two methods for detecting the telomere G-overhang structure in Trypanosoma brucei, which are native in-gel hybridization and ligation-mediated primer extension, which will be described. Sandhu, R., Li, B. Examination of the Telomere G-overhang Structure in Trypanosoma brucei. J. Vis. Exp. (47), e1959, doi:10.3791/1959 (2011). The telomere G-overhang structure has been identified in many eukaryotes including yeast, vertebrates, and Trypanosoma brucei. It serves as the substrate for telomerase for de novo telomere DNA synthesis and is therefore important for telomere maintenance. T. brucei is a protozoan parasite that causes sleeping sickness in humans and nagana in cattle. Once infected mammalian host, T. brucei cell regularly switches its surface antigen to evade the host's immune attack. We have recently demonstrated that the T. brucei telomere structure plays an essential role in regulation of surface antigen gene expression, which is critical for T. brucei pathogenesis. However, T. brucei telomere structure has not been extensively studied due to the limitation of methods for analysis of this specialized structure. We have now successfully adopted the native in-gel hybridization and ligation-mediated primer extension methods for examination of the telomere G-overhang structure and an adaptor ligation method for determination of the telomere terminal nucleotide in T. brucei cells. Here, we will describe the protocols in detail and compare their different advantages and limitations. Principle (Figure 1): Under native condition, an end-labeled (CCCTAA)4 (TELC) oligo probe can only hybridize to the single-stranded telomere G-overhang region. The hybridization intensity is proportional to the length of the overhang. After denaturation and neutralization, the same probe will be able to hybridize to the whole telomere region. The hybridization intensity represents the total telomere DNA amount and can be used as a loading control. Two standard controls for this experiment are hybridization using end-labeled (TTAGGG)4 (TELG) oligo probe, which should not yield any signal as T. brucei cell does not have telomere C-overhang structure, and to treat the genomic DNA with 3'-specific single-stranded exonucleases such as Exo I or Exo T prior to hybridization, which should eliminate the native TELC hybridization signal. Intact chromosomes will be separated by PFGE. Therefore, genomic DNA is prepared as DNA plugs. Start with 100 mL of bloodstream form cells (at 1.5 -2 million cells/ mL) or 20 mL of procyclic cells (at 10 million cells/ mL). Dissolve 1.6% low-melting point (LMP) agarose in L buffer (0.01 M Tris • CL pH 7.6, 0.02 M NaCl, 0.1 M EDTA pH 8.0) and keep it warm at 50°C. Harvest cells by centrifugation at 1.5 krpm, 4°C for 10 min. Remove supernatant and resuspend cell pellet with L buffer to a final concentration of 5 million cells/ mL. Incubate cell suspension at 42-50°C for 10 min. Add 1 volume of LMP agarose to 1 volume of cells. Mix well but quickly. Aliquot 85 μL of cell suspension to each well of a disposable plug mold (BioRad). After 5-10 min or until the plugs are solidified, transfer plugs into a 15 mL Conical tube with 5 mL L buffer/1% Sarkosyl. Add 100 μL of 250 mg/ mL proteinase K or a pinch of proteinase K powder, mix well, and incubate at 50°C for 48 hrs. Discard the buffer, wash plugs with 5 mL of L buffer twice and repeat proteinase K digestion for another 48 hrs. Wash plugs with fresh L buffer again. Store plugs at 4°C in L buffer. These plugs should be used within 2 weeks. Prepare 2-3 L of 0.5 x TBE buffer and transfer to the gel running chamber of a CHEF DRII (BioRad) unit. Set the running temperature, start the pump, then start the cooling unit. Prepare 100 mL of a 1.2% agarose gel in 0.5 x TBE buffer. Cool agarose while setting up the gel tray. Decide the sample order. Remember to include the DNA standard. Dry the comb and lay it on a flat surface. Place each DNA plug onto the appropriate tooth. Remove excessive buffer around the DNA plug by aspiration so the plug will stick to the tooth. Pour the agarose gel without inserting the comb. Let it cool down to 40-50°C (a few minutes), slowly insert the comb with the attached plugs into the gel. Make sure that plugs do not slide off the comb. Let the gel solidify. Remove comb from gel slowly. Run gel in a CHEF DRII unit: 700 s-1500 s pulses, 2.5 V/cm, at 12°C for 120 hrs. Stain the gel with 1μg/ mL Ethidium Bromide in 0.5 x TBE at RT for 1 hr then in 0.5 x TBE without Ethidium Bromide for 1 hr with gentle rocking. Take a picture of the gel. Place the agarose gel on two layers of 3 mm Whatman paper and cover the gel with plastic wrap. Dry the gel at RT (the gel should not be heated more than 50°C to avoid any denaturation of the DNA samples). Replace the wet Whatman papers with dry ones after 2 and 4 hrs of drying, respectively. Keep drying until the gel is completely dry. This may take overnight depending on the dryer. Mix 1 μL of 50 ng/ μL TELC or TELG oligo with 1 μL of 10 x Polynucleotide kinase (PNK) buffer, 5 μL of γ[32P] ATP, 2 μL of ddH2O, and 1 μL of T4 PNK. Incubate at 37°C for 1 hr. Add 90 μL of TNES buffer (10 mM Tris Cl, pH 8.0, 100 mM NaCl, 10 mM EDTA, pH 8.0, 1% SDS) to the reaction mixture. While labeling the oligoes, prepare a G-25 column: put some glass wool into a 3 cc syringe and stuff it down tightly with a pipette tip. Fill the syringe with Sephadex G-25 fine (autoclaved in TE) to the 3 mL mark. Let it settle by weight. To purify the labeled probe: load the probe on top of the column. Wash with 700 μL of TNES buffer, and elute with 600 μL of TNES buffer. Alternatively, purify the labeled probe using a mini Quick Spin™ column (Roche Applied Science). Place the gel in a hybridization bag and add 20 mL of hybridiztion buffer (0.25M Na2HPO4 pH7.2; 1 mM EDTA; 7% SDS; 1% BSA, filtered through 0.22 μm filter). Incubate in a water bath at 50°C with gentle rocking for at least 1 hr. Remove the pre-hybridization buffer. Boil the labeled probe for 5 min and add it to 25 mL of fresh hybridization buffer, filter-sterilize the mix with a 0.22 μm syringe filter and add the hybridization mix directly to the hybridization bag. Seal the bag and place in a shallow container with warm water. Place the whole container into the water bath. Incubate at 50°C overnight with gentle rocking. Cut a small opening in the hybridization bag. Pour out as much as possible the hybridization mix and save it in a 50 mL Conical tube. Keep the probe frozen at -20°C. Remove the gel from the hybridization bag and put it in a container. AT THIS STEP EVERYTHING WILL BE HOT AND NEEDS EXTENSIVE CLEANING (BENCH, SCREEN, SCISSORS, ETC. MAKE SURE TO WEAR DOUBLE LAYERS OF GLOVES!!! Wash the gel in 4 x SSC for 30 min at 50°C. Replace with fresh wash buffer and repeat twice. Wash the gel in 4 x SSC/0.1%SDS at 50°C. Put the gel on a piece of 3 mm Whatman paper and lightly dry the gel. Repeat the hybridization using the same probe-containing hybridization mix at 55°C overnight. Wash as described above except at 55°C. Wrap the gel and expose to phosphorimager for ~ 2 hrs. Scan the phosphorimager. Normalize the hybridization signal obtained before denaturation with that obtained after denaturation. Principle (Figure 2A & 2B): A 5' end-labeled unique oligonucleotide is ligated to the 3' end of the G-overhang. 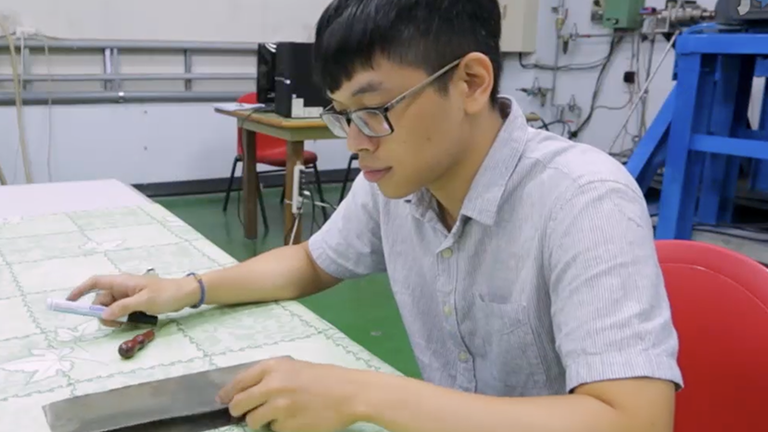 This is accomplished by annealing to specific complementary guide oligo. Only the unique/guide oligo adaptor bearing sequences compatible to the telomere G-overhang terminal sequences will be ligated. For T. brucei, telomeres may terminate in one of six different nucleotides of the TTAGGG repeats. Hence six different guide oligoes are used (TG1-TG6, Figure 2A). After ligation, DNA is digested with restriction endonucleases and resolved on an agarose gel. Kinase treatment of the unique oligo. Mix 6 μL of 10 pmole/ μL unique oligo with 3 μL of 10x PNK Buffer, 5 μL of γ[32P] ATP, 14 μL of ddH2O, and 2 μL (10 U) of T4 PNK. Incubate the mixture at 37°C for 1 hr. Use Qiaquick nucleotide removal kit to remove the unincorporated hot ATP and elute the end-labeled oligo with 60 μL of Elution Buffer (final concentration would be ~ 1 pmole/ μL). Anneal unique oligo to guide oligo (to create the adaptor). Add 10 μL of purified unique oligo to 2 μL of each guide oligo and 1 μL annealing buffer (200 mM NaCl, 100 mM Tris-HCl pH 8.0). Put tubes into a 85°C heat block and turn off the heat block. Let the tubes and heat block cool to RT. This will take a few hours. If in a hurry, transfer tube after 5 min each to 65 °C, then 37°C and then let it cool to RT. Ligate adaptors to total genomic DNA. To 2.5 μL of intact genomic DNA, add 4 μL of 5 x Ligase buffer, 10 μL of annealed oligos, 2.5 μL of ddH2O, and 1 μL of T4 DNA Ligase. Incubate at 16°C overnight. To 20 μL of ligation product add 3 μL of 10 x NEB buffer 4, 1.5 μL of AluI and MboI each, and 4 μL of ddH2O. Incubate the mixture at 37°C overnight. Add 3 μL of 10 x Orange G dye (50% glycerol, 0.5% Orange G) to each sample. Load the DNA samples on a 20X20 cm 0.7% agarose gel in 0.5 x TBE with 0.2 μg/ mL Ethidium bromide. Run at 30V for 30 min, then continue with higher voltage but less than 120V to a total of 1000 v hr. Take a picture of the gel with a ruler next to the DNA marker. Put the agarose gel on a layer of DE81 filter paper and two layers of 3 mm Whatman paper and cover the gel with plastic wrap. Dry gel at RT. Expose the dried gel to phosphorimager overnight. Principle (Figure 2A & 2C): A unique oligonucleotide is ligated to the 3' G-overhang with specific terminal sequence, determined by its complementary sequences in the adaptor (guide) oligo. 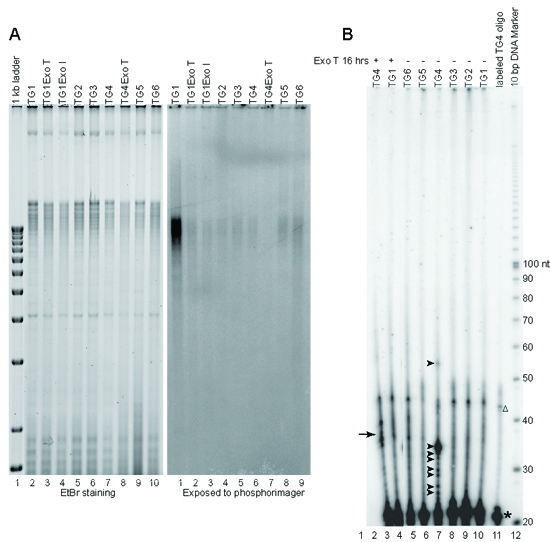 After purification, the labeled guide oligo that remains annealed to the G-overhang/unique oligo is primer extended to the ss-ds junction using T4 DNA polymerase, which lacks strand displacement and 5'-3' exonuclease activities. The primer extension products therefore give the length of the G-overhang. Mix 20 μL of 10 pmole/ μL unique oligo with 10 μL of 10 x PNK buffer, 20 μL 5 x ligase buffer (which contains 10 mM ATP), 3 μL (30 U) of T4 PNK, and 47 μL of ddH2O. Incubate the mixture at 37°C for 60 minutes. Mix 1 μL of 10 pmole/ μL guide oligo with 1 μL of 10 x PNK buffer, 2 μL of γ[32P] ATP, 1 μL (10 U) of T4 PNK, and 5 μL of ddH2O. Incubate the mixture at 37°C for 60 minutes. Add 10 μL (20 pmole) of the phosphorylated unique oligo and 10 μL (10 pmole) of the end-labeled guide oligo in a 1.5 mL Eppendorf tube (the 2:1 ratio of unique to guide oligo ensures that all guide oligo is annealed). Follow the same procedure described in protocol II for annealing oligoes. Follow the same procedure described in protocol II for DNA ligation. Precipitate DNA with 1/10 volume of Sodium Acetate and 2.5 volume of ice-cold Ethanol at -80°C for 30 min. Spin down DNA pellet at 12 krpm, 4°C for 15 min. Wash DNA with 70% of Ethanol and dissolve pallet in 10 μL of ddH2O. To each 10 μL DNA sample add 2 μL of 10 x T4 DNA Polymerase buffer, 1 μL of 1 mg/ mL BSA, 1 μL of 25 mM dATP, dCTP, and dTTP each, 1 μL (3 U) of T4 DNA Polymerase, and 3 μL of ddH2O. Make a master mix with the polymerase, buffer, etc. and aliquot appropriate amount of the master mix to each DNA sample. Incubate at 30°C for 30 min. Then add 1.2 μL of 0.5M EDTA immediately to the reaction. Run extension products on a 10% acrylamide/7 M urea/1xTBE gel. Load 4 μL of each sample. Boil the samples for 10 minutes before loading. Run at 800V in 1x TBE until the blue dye reaches the bottom of the gel. Dry the gel at 65°C for 30 min then at RT for 30 min and expose to phosphorimager for 2 hrs. To prepare 100 mL of 10% polyacrylamide Gel, dissolve 41 g of Urea and 21 mL of 40% Acrylamide solution (acrylamide/bis-acrylamide 29:1) in 30 mL of distilled water, add 10 mL of 10x TBE. Assemble glass plates. Right before pouring the gel, add 1 mL of 10% APS and 100 μL of TEMED. Pour the gel and try to avoid any bubbles. Intact T. brucei chromosomes separated by PFGE are shown in Figure 3A and 3B (left panels). T. brucei cells normally contain ~ 100 copies of minichromosomes, all with similar size (50-150 kb) and migrate to the same position on the gel (MC). Due to this fact, after hybridization with TELC oligo probe, the telomere G-overhang signal is most prominent on minichromosomes (Figure 3A, middle panel). Hybridization with TELG oligo probe normally does not yield any hybridization signal (Figure 3B, middle panel) because T. brucei cells do not have telomere C-overhang structure. After denaturation and neutralization, hybridization with either TELC or TELG oligo probe should reveal telomere signals on all chromosome ends (Figure 3A & 3B, right panels). Loading equal amount of DNA in each lane is essential for this assay, and this is shown by Ethidium Bromide staining of the gel. An example is shown in Figure 4A, left panel. 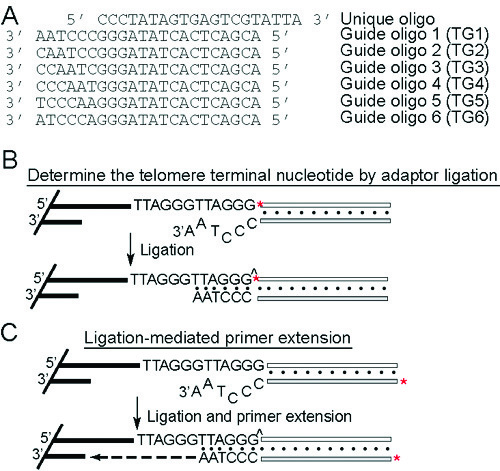 In this protocol, the end-labeled unique oligo and guide oligo adaptors are only ligated to chromosome end when the telomere G-overhangs ending with sequences that are compatible with the guide oligo. Since the unique oligo is end-labeled, the ligation product will be radioactive and give strong signal. As shown in Figure 4A, right panel, lane 1 gives a strong signal, indicating that a large amount of unique/TG1 adaptor has been ligated to the telomere end. TG1 has an ending sequence of 5'CCCTAA3'. Hence the telomere G-overhangs ligated to this adaptor end in 5'TTAGGG3'. No significant amount of ligation products is observed using other guide oligoes, indicating that telomeres ending in TTAGGG are predominant in T. brucei cells. Without ligation, the end-labeled guide oligo is 22 nt long. Loading end-labeled guide oligo would serve as a negative control and a size marker. (Figure 4B, lane 11, asterisk indicates the end-labeled guide oligo). We normally also observe a band of ~ 44 nt in this negative control (Figure 4B, lane 11, open triangle), which are most likely residue non-denatured adaptors. After ligation to the chromosome end, the size of the extended product reflects the length of G-overhang structure. Most T. brucei telomere G-overhangs end in 5'TTAGGG3' (Figure 4A). However, these G-overhangs appear to be very short (only ~ 10 nt long), as products extended from the ligated TG1 guide oligo are not much longer than the guide oligo itself (Figure 4B, lane 10), but they allow ligation of TG1 adaptor (Figure 4A, right panel, lane 1). Although only a small amount of TG4 adaptor was ligated to the telomere ends (Figure 4A, right panel, lane 6), products extended from ligated TG4 are much longer (Figure 4B, lane 7, arrow heads), with the longest product being ~ 55 nt. Hence, we observed two types of telomere G-overhang in T. brucei cells. The predominant telomere G-overhangs end in 5'TTAGGG3' but are only ~ 10 nt long. Few telomere G-overhangs end in 5'GGGTTA3' but can be upto 40 nt long. Both types of G-overhang are sensitive to Exo T (or Exo I) treatment (Figure 4A, right panel, lane 2, 3, and 7; Figure 4B, lane 1, arrows). Figure 1. Principle of native in-gel hybridization. Left, under the native condition, the end-labeled TELC oligo probe can only hybridize with the single-stranded G-rich telomere overhang. The intensity of the hybridization reflects the length of the telomere G-overhang. Right, after denaturation, the TELC oligo probe will hybridize with all telomere DNA. The intensity of this hybridization represents the total amount of telomere DNA and is used as a loading control, and the final G-overhang level is calculated by dividing the native hybridization signal by that obtained after denaturation. Figure 2. Principle of Adaptor ligation and ligation mediated primer extension. (A) Sequences of the unique and six guide oligoes. (B) Determine the telomere terminal nucleotide by adaptor ligation. The unique oligo is end-labeled (marked with a red asterisk), annealed to the guide oligoes and ligated to the telomere end. Only when the unique/guide adaptor bears a 3' overhang that is compatible with the terminal telomere sequence will the adaptor be ligated. (C) In ligation mediated primer extension, the guide oligo is end-labeled (marked with a red asterisk) and annealed to the unique oligo before ligated to the chromosome ends. Only the unique/guide adaptor bearing a 3' overhang compatible with the G-overhang will be ligated. ^ indicates the ligated phophordiester bond. After removal of the unligated oligo pairs, primer extension will be carried out with T4 DNA polymerase, which lacks strand displacement and 5'-3' exonuclease activities. The final length of the extended guide oligo therefore reflects the length of the G-overhang. Figure 3. T. brucei telomere G-overhang structure analyzed by native in-gel hybridization. (A) In-gel hybridization with TELC oligo probe. (B) In-gel hybridization with TELG oligo probe. In both (A) and (B) Left, Ethedium Bromide stained PFG. Middle, native hybridization result. Right, post-denaturation hybridization result. Wild-type T. brucei cells were used. Intact or Exo I treated genomic DNA were separated by PFGE. Open triangle stands for the megabase chromosomes; IC, intermediate sized chromosomes; MC, minichromosomes. Figure 4. T. brucei telomere G-overhang structure analyzed by ligation-mediated primer extension. (A) Most T. brucei telomere G-overhangs terminate in 5'TTAGGG3'. Left, Ethedium bromide stained DNA gel. Approximately equal amount of DNA is loaded in each lane. Right, exposure result of the same gel after drying. 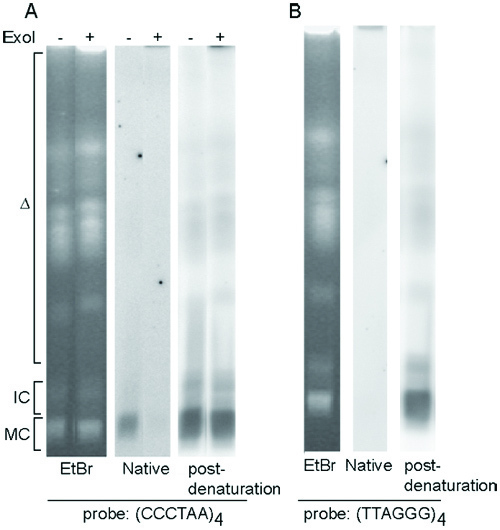 Intact, Exo I-treated, or Exo T-treated DNA was ligated to six different end-labeled unique/guide oligo adaptors as indicated. (B) T. brucei telomeres have short G-overhangs. Intact or Exo T-treated genomic DNA was ligated to six different unique/guide oligo adaptors followed by primer extension using T4 DNA polymerase. End-labeled TG4 oligo was loaded as a negative control (lane 11). The oligo itself runs at 22 nt (*) but also gave a fainter signal at ~ 44 nt (Δ). Only unique/TG4 adaptor yielded extension products significantly longer than the guide oligo itself (arrow heads, lane 7). Trypanosoma brucei causes sleeping sickness in humans. This disease, if left untreated, is inevitably fatal. T. brucei cells in mammalian hosts undergo antigenic variation regularly so as to evade the host's immune attack 7. Hence it is very difficult to eliminate T. brucei cells once an infection is established. We have recently demonstrated that telomeres play an important role in regulation of the expression of T. brucei surface antigen gene 8. Therefore, it is important to further understand the functions of telomeres and the mechanisms for telomere maintenance in T. brucei cells. The telomere G-overhang structure is essential for telomerase mediated telomere maintenance 5. Methods for measuring the telomere overhang lengths are valuable for studying the mechanisms of telomere maintenance. We have successfully adopted the native in-gel hybridization 3 and ligation-mediated primer extension 6 method for analyzing T. brucei telomere G-overhang structure and adaptor ligation method for determination of telomere terminal nucleotide. Both the native in-gel hybridization and the adaptor ligation method can reveal the total amount of the G overhang in the cell, but only the ligation mediated primer extension can reveal the exact G overhang length. For native in gel hybridization, it is important not to denature the DNA sample throughout the preparation steps. This can be controlled by hybridizing DNA with TELG oligo probe. Since there is no telomere C-overhang, native TELG hybridization should not yield any signal unless the samples are partially denatured. The sample should also be used within two weeks as the telomere G-overhang is very sensitive to any nuclease activity. For adaptor ligation and primer extension, purified oligoes yield clearer results. Exo T is more effective than Exo I for cleaving 3' specific single-stranded overhang DNA. Equal loading of annealed samples are essential for quantification of the total amount of telomere G-overhang. We would like to thank Dr. Carolyn Price for scientific discussions and insightful suggestions. This work is supported by NIH grant AI066095 (PI: Bibo Li). Munoz-Jordan, J. L., Cross, G. A., de Lange, T., Griffith, J. D. t-loops at trypanosome telomeres. EMBO J. 20, 579-588 (2001). Li, B., Espinal, A., Cross, G. A. M. Trypanosome telomeres are protected by a homologue of mammalian TRF2. Mol Cell Biol. 25, 5011-5021 (2005). Wellinger, R. J., Wolf, A. J., Zakian, V. A. Saccharomyces telomeres acquire single-strand TG1-3 tails late in S phase. Cell. 72, 51-60 (1993). McElligott, R., Wellinger, R. J. The terminal DNA structure of mammalian chromosomes. EMBO J. 16, 3705-3714 (1997). Harrington, L. A., Greider, C. W. Telomerase primer specificity and chromosome healing. Nature. 353, 451-454 (1991). Jacob, N. K., Skopp, R., Price, C. M. G-overhang dynamics at Tetrahymena telomeres. Embo J. 20, 4299-4308 (2001). Barry, J. D., McCulloch, R. Antigenic variation in trypanosomes: enhanced phenotypic variation in a eukaryotic parasite. Adv Parasitol. 49, 1-70 (2001). Yang, X., Figueiredo, L. M., Espinal, A., Okubo, E., Li, B. RAP1 is essential for silencing telomeric variant surface glycoprotein genes in Trypanosoma brucei. Cell. 137, 99-109 (2009).